One year ago this month, my sister-in-law and I started a little side project called Risen Motherhood, a podcast about gospel-centered motherhood. We promised each other we'd just do five episodes and be done. It was a way to synthesize and share some of our thoughts about motherhood and eternity, and a fun chance to get to work together after blogging individually for so many years. We also had a feeling that if we were spending so much air time in our offline relationship talking about how the gospel impacts mundane things like potty training, meal planning and breastfeeding, then other moms probably were too – and maybe they'd like to listen in to a conversation about it. And what we found was, our hunch was right. What started out as a small pet project has turned into full-blown ministry for she and I. So much so, that one year later, we have a website, social media platforms, forty plus episodes in the archives, and thousands of women tuning into hear the show every week. And what we really found, was that we are not alone in our desire to push for more in our motherhood. We found a community of women who are eager grow in their understanding of the beauty and brilliance of work that was given to them by God to do. We found women that are tired of the world's empty messages on motherhood and instead long to fill up on the power and blessing of the work accomplished by Christ on the cross. We found fellow moms with a hunger to allow the gospel to impact their lives in a significant way, recognizing redemption matters, even in the mundane. We are mothers who want more. Who will not settle. We know motherhood is a holy task ordained to us by God, and we have one shot at it, so we won't waste it. We know we won't get it all right, we fully recognize that we can't do it all and are not perfect, but we serve the one who is perfect and does get it all right. We live in the in-between, the crack in the middle, the beautiful, marvelous, near un-believable space of grace. We recognize that the very same hands that were stretched wide on the cross for us, hold us now, sending us out with an eternal purpose in our motherhood. And this – this is one of the most exciting things I've ever been apart of. While I can quickly list off all the reasons I'm unqualified to be apart of this ministry, I feel God asking me to let go of my reservations and hesitations and be all in with Risen Motherhood. It's taken me nearly an entire year after Risen Motherhood's launch to even begin to seriously adjust where and how my time is spent online, but it's become clear to me over the past couple months that something needs to give. With a third baby on the way, a fourth and fifth arriving any time through adoption, and the desire to continue being a faithful, dedicated, full-time stay-at-home-mom, I need to make some hard decisions about where I spend my time. Beyond motherhood and being a wife, I prioritize healthy relationships with my extended family friends both near and far, and I desire to always leave space to serve in my local church through women's ministry, small groups and service needs as they arise. The gospel is everything to me. And while over the past couple of years I've made a lot of changes in the way I write and what I write about in this particular space, Risen Motherhood lends itself to the spread of the gospel in ways I never knew I could be apart of. And as God began to reveal this to me, letting go of something I've invested so much of my heart in over the past six and half years (!) became a whole lot easier. I don't want to live divided, and while some people are, honestly, I'm just not good at managing multiple social media accounts or writing for multiple platforms – I started to find that much of the content I desired to share was duplicative between platforms and I began to struggle with what to put where, paralyzing me to not be able to share anything at all. And for those reasons, it's time to let this space go. It's not a "goodbye-forever," but it is a closing of a chapter. I know that technically I don't owe anyone anything, nor am I disillusioned into believing that anyone would every really wonder where I am if I stopped writing without any formal goodbye, but for my own heart, I need to take time to release this space, so I can fully invest in another. That said, it's not a true goodbye! I'll still be very active online, and you can consistently find me through Risen Motherhood. While I'll be allowing my blog Facebook page to go dormant, I'll still post on my personal IG because I just can't help myself - it's still my favorite medium. Podcasting: At Risen Motherhood, we release a show every week at 5 a.m. on Wednesdays. Stream each show directly from the site, or find us on iTunes or your favorite streaming app (This is mine). Writing: If you like the type of content I used to push out here or on my personal Facebook or Instagram, head to Risen Motherhood's platforms (Instagram / Facebook / Twitter). I'll be microblogging as well as sharing little videos on Insta-Stories (an Instagram feature) with behind-the-scenes snippets of RM and gospel-centered encouragement for moms. Daily Life and Updates: For peeks into our family's daily life, adoption and baby #3 updates, or just to find out what I'm up to, come find me on my personal Instagram, (@laurawifler). Finally, I just want to extend a huge thank you to all of you who have supported me and my writing. Many of you have been with me for years and others have only recently found me. All of you are what has made this space so hard to let go of. I have loved forming relationships with many of you online, and have learned so much from you sharing your thoughts, opinions and encouragement with me. And if you found yourself identifying with the type of mother I shared above, I do hope you'll come join the Risen Motherhood community. God is doing big things with this ministry and I know he's only just getting started. Hello! I'm Laura, a wife of eight years and momma to three young children. I love to dream, create, and share the good news of the gospel with other women. This is my personal blog, but I don't write here anymore, and have recently removed the archives to clean up my "online footprint." 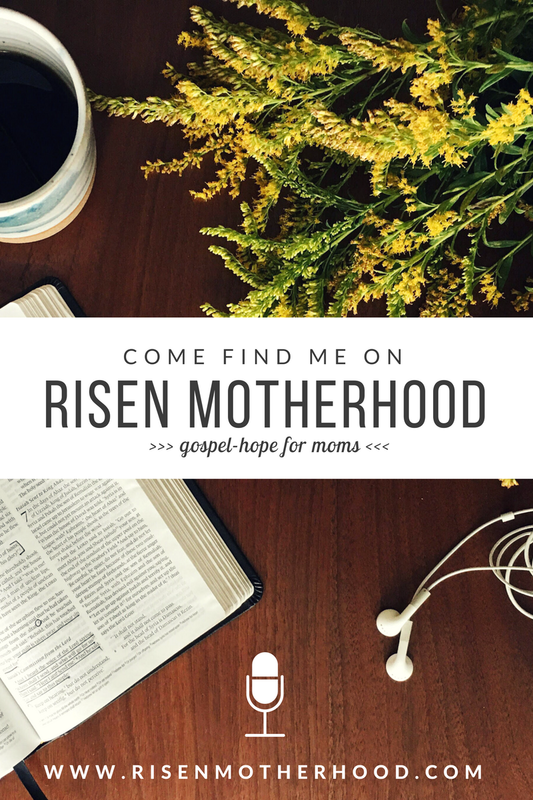 I currently spend my time as the owner of Risen Motherhood, a ministry bringing gospel-hope to moms. Come join us!